Mix together the allspice, salt, garlic powder, sugar, chilli powder, ground cloves, thyme, ground black pepper, cayenne pepper and ground cinnamon in a large bowl until all combined. Your dry jerk mix should look like this. Add the pineapple juice and mix to a thick, but workable paste. After you've added pinepple juice, your paste should look like this. Add the diced chicken to the bowl and mix it in to coat the chicken thoroughly. When you mix the raw diced chicken with the jerk paste, it should look like this. Place on a baking tray in the middle of the oven at gas mark 6 for approx. 20-30 minutes until cooked thoroughly. If the jerk chicken comes out to dry or the taste is too hot for your tastebuds, add a splash of extra pineapple juice as soon as you've put it on the plate. Put the Aunt Bessie's Yorkshire puddings in for the last 4 minutes of cooking - they're so fast to cook! Put the coconut milk and sunflower oil in a large pan and bring to the boil. Add the chopped onion and crushed garlic, followed straight away by the thyme, tin of black eye beans (inc. juices) and cup of water and bring to the boil again. Lower the heat to a low-medium heat and simmer. Rinse 2 cups of long grain rice (do not use easy cook rice), add to the pan and stir thoroughly. Place the Scotch Bonnet peppers on top (do not stir in) . If you like it as spicy as possible, do like me and add 5-6 Scotch Bonnet peppers instead of 4! Cover tightly and leave on a low light for approx. 30 minutes until all the liquid has evaporated. Try not to remove the pan lid unless necessary until at least 30 minutes have passed. This is what it should look like just before your cover it. When the rice is cooked, it should look like this. Place the Yorkshire pudding in the centre of the plate and add some jerk chicken. Next, put the rice out around the Yorkshire pudding. Serve with hot pepper sauce. Enjoy! Your finished food should look like this. This is a nice quick meal to prepare and you will probably have most of the ingredients in your cupboard if you cook regularly anyway. Preparation takes about 5-10 mins and cooking time is a maximum of 30 minutes with minimum attention required during cooking leaving you to get on with other things! 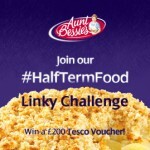 I'm taking part in the BritMums and Aunt Bessie's #HalfTermFood linky challenge and this is my entry. Great recipe and love how you tell people how to make it less hot if required. Incorporating Aunt Bessies Yorkshire puddings into an old favourite is inspired.